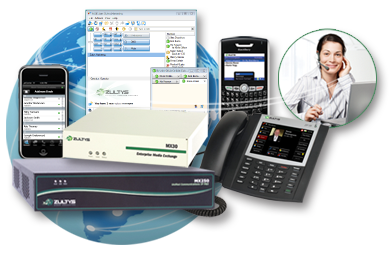 Zultys IP PBX – Business Telephone Systems | VoIP | Network Cabling – TelNet of Virginia, Inc.
Zultys is the leading open standard IP PBX telephone systems provider that allows you to do a lot more with less. Being one the most feature rich platform in the industry, we bring about a dependable enterprise class Phone Switch that is easy to deploy, use and manage. It is has attributes, such as soft phone, Find me Follow me, Presence, Unified Messaging, Voice Mail, Secure Chat/IM, Teleworker support with NO VPNs needed, Fax Server, Mobile client (Blackberry and iPhone) integration, Twinning, eFax, Call-Record, Conference Bridge, Web Conference, Inbound call center, IVR, SIP desktop and cordless phones support, as well as the ability to interface with SIP Trunks (with no licensing or external gateways and other point of failures), as well a T1/E1/PRI and much more. Their thin (30MB) desktop software (CTI), makes it possible to run these applications (and others) from one thin desktop application that works elegantly on a Mac, Linux or PC (64 or 32 bit), all WITHOUT requiring expensive external servers like most of our competitors do. In essence, we do much more out of our 2U secure Rack Mountable Open Standard (not open source) appliance than most of our competitors can do with an entire rack of servers, all at a compelling price point that easily scales to 128 locations and 10,000 users, with superb redundancy and high availability thanks to our patented distributed processing method, and automatic and quick failover across LANs or WANs.